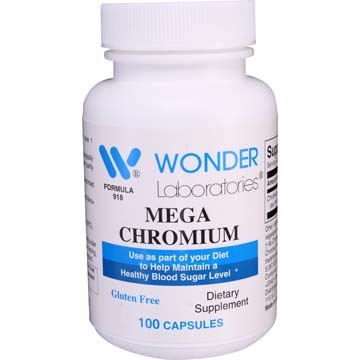 Mega Chromium (chromium picolinate) is an essential component in metabolic processes that help the body to regulate healthy blood sugar levels. 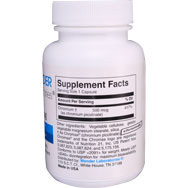 Chromax ® is a patent protected product, and is a biologically active source of chromium and is one of the highest in quality and purity available. Other ingredients: Vegetable cellulose, gelatin, vegetable magnesium stearate, silica. Directions: As a dietary supplement, take one capsule daily. 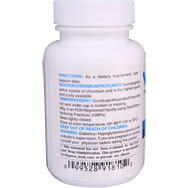 Made in an FDA Registered Facility using Good Manufacturing Practices (GMPs). †Chromax ® is a registered trademark of Nutrition 21, Inc. Warnings: Diabetics/Hypoglycemics use only under a doctor's supervision. If you are pregnant or nursing, consult your physician before taking this product.